Tak jsem se trochu sháněl po tom novém tank destroyeru. Víme, co to není: není to Dickermax (105mm houfnice postavená ve stylu tank destroyer na podvozku Panzer IV) a není to Heushrecke (samohybné dělo postavené na podvozku Panzeru IV s otáčivou věží). Jinými slovy, je to podvozek z Panzeru IV, na kterém sedí posazený 88mm flak. Co za typ je ta 88? To není přesně jasné. Ve vývoji bylo několik verzí, z nichž ta ranná nebyl protitankový kanon, který se z 88mm flaku vyvinul, ale skutečný 88mm Flak 37 (L/56), který by nejspíš měl stejné nebo horší (odlišné střelivo) vlastnosti, než krátká 88. V experimentální fázi ovšem byla i verze s dělem Flak 41, které mělo podobné vlastnosti jako 88mm L/71, takže je dost možné, že ve hře budou obě. Zatímco trup je ze staré verze Panzeru IV (čili pancéř někde kolem 30mm), korba není pancéřována prakticky vůbec. V podstatě půjde o velice křehký a nejspíš nikterak rychlý stroj, ale s mohutným (na tier 5) dělem. Vzhledem k tomu, že vozidlo je tak křehké hádám, že na něj "prsknou" i možnost "dlouhé" 88, aby mělo nějakou výhodu. Ono ještě taky není jisté, zda ta zbraň bude plně otočná. Ony ty bočnice, které slouží jako podlaha pro osádku, jsou sklopné a v přepravní poloze jsou vyklopeny vzůru a obepínají zbraň. Něco jako u GWP (ten by taky v bojové poloze měl mít ty štíty sklopené a zbraň plně otočnou, bohužel nám tu WG dal pochodovou pozici). Každopádně by to mohlo mít perfektní dohled a při otočné zbrani by to mohla být dobrá metla (s 88 na 2-3 rány vše do tieru V včetně). Plně otočné by to mělo být stopro - nezapomeň, že to není stíhač tanků, ale protiletadlový prostředek, kde je plné otáčení nezbytné. V poslednim ATM je popsany velmi podobny ceskoslovensky povalecny projekt - podvozek T-34/85 a na nem temer nepancerovana protiletadlova dlouha 57mm (cs. vyroby). S bojem proti pozemnim cilum se s tim take pocitalo, tak si rikam, ze by to byl vystavni kousek do pripadne ceskoslovenske vetve, napr. nad T-25. Mno pozor, on je to díky absenci korby něco jako obrněný žebřiňák. Ale nasiel som taketo TD a ktomu toto : Дня доброго. В новой редакции дерева немецкой техники во второй ветке пт присутствует Pz.Sfl.IVc. По найденной мною информации, это полевая модификация Brückenlager IVc произведенная третьей танковой дивизией зимой 41-42. Edited by Guevarache, 09 October 2012 - 03:36 PM. To druhé je podvozek Panthera pokud koukám správně. To třetí to na 99 procent nebude, podívej na to dělo. O tom tretom som trocha pohladal, a je to Polna uprava Brückenlagera viz. obr. The equipment consists of the 7.5 cm Pak 40 mounted on a turretless chassis of a Pz. Kpfw. 38 (t) tank of Czech origin, formerly known as the L.T.H. This mount was used by the Germans in large numbers on the Russian front. It usually moves just in the rear of the first wave of tanks. Its road performance approximates that of the Pz. Kpfw. 38 (t) tank. Due to the bolted construction of the parent vehicle the removal of the turret, superstructure top plate and the engine access hatches of the original tank is readily accomplished and the mounting of the anti-tank gun is speedily performed. The turntable of the anti-tank gun is bolted to the angle section formerly carrying the superstructure top plate of the original tank. The gun shield is constructed from 10-15 mm plate. It is open at the top and rear. The protection afforded the crew is little better than would be found on a field piece. The gun, which projects well beyond the front of the hull, is of monobloc, loose barrel construction, and is fitted with a double baffle muzzle brake. The breech ring is rectangular and is secured to the barrel by a loose screwed collar. The recoil mechanism is attached underneath the ring by a detachable lug. The elevating and traversing mechanisms are controlled by hand wheels. The gun has the following muzzle velocities: HE 1800 f.s. ; A.P.C., 2525 f.s; hollow charge 1476 f.s. The A.P.C. shell will penetrate homogeneous armor as follows: 500 yards 4.0 ins. at 30° obliquity, 4.8 ins. normal—1000 yards 3.6 ins. at 30°, 4.3 ins. normal—2000 yards 2.8 ins. at 30°, 3.4 ins. normal—2500 yards 2.5 ins. at 30°, 3.0 ins. normal. The gun has a traverse of 65° and an elevation of -5° to + 22°. Length 15 ft., 3 ins. Height 7 ft., 2 ins. Tread centers 5 ft., 9 1/2 ins. Ground contact 8 ft., 6 3/4 ins. Width of track 11 ins. Pitch of track 4 1/2 ins. The French Lorraine tank chassis, in addition to being utilized as a self-propelled mount for the German 15 cm heavy field howitzer and the 15 cm heavy infantry gun, is also used for the high-velocity antitank gun, 7.5 cm Pak 40. The Lorraine suspension arrangement consists of six small bogie wheels on each side, sprung in three pairs on three semi-elliptical springs. The driving sprocket is at the front, the track-adjusting idler at the rear, and four return rollers, located at the ends of the suspension springs, return the track, which is of the dry-pin type with outside center guides. The power plant of this vehicle is the six-cylinder, in-line, water-cooled Delahaye engine rated at 70 hp. The ignition system is Bosch. Its main and reserve gasoline tanks hold 20 gallons and 5 1/2 gallons respectively. The semi-automatic gun of monobloc construction is mounted within a high, open top, box-like shield, constructed of sloping 10 mm plate, well back on the chassis. The original gunshield overlaps the superstructure shield at the front. The gun is 134 inches in length and its muzzle with brake extends beyond the front of the chassis. The piece has the following muzzle velocities: H.E., 1800 f/s; A.P.C., 2525 f/s. Its appropriate elevation is -5° to +22°; traverse 65°. At 1000 yards, firing A.P.C. shell, it will defeat 3.6 inches of homogeneous armor at 30° obliquity, and 4.3 inches at normal. Width 6 ft., 2 ins. Tread centers 4 ft., 4 5/8 ins. Width of track 10 ins. Pitch of track 3 3/16 ins. This vehicle is an ex-Czech light tank chassis mounting a Russian 7.62 cm Pak 36 ®. The mechanical layout and components are identical with those of the Pz. Kpfw. 38 (t) tank and its road performance will therefore be similar. The conversion to a self-propelled mounting has been achieved by the removal of the turret and the superstructure top plate of the original tank. The turntable for the gun is mounted on the superstructure at four points on transverse and lateral beams. A three-sided shield of 10 mm plate is secured by bolting and welding to the original front gun shield, and by tubular supports to the mounting. This shield traverses with the gun. A sliding mantlet is provided in the shield to permit elevation and depression of the gun. A lower, fixed three-sided shield is bolted to the superstructure. This is of 15 mm plate. The sloping side covers have been replaced by flat hatches hinged to the sides. The gun is of monobloc construction with detachable breech ring. It has an over-all length, including the double baffle muzzle brake and breech lock, of 163 1/2 ins. The elevating gear is driven from a handwheel, on a traverse axis, on the left of the gun. The traversing gear is hand operated from the right. The gun has the following muzzle velocities: HE shell, 1805 f.s; A.P.C. shell, 2430 f.s. The penetration performance firing A.P.C. shell against homogeneous armor is as follows: 500 yards 3.7 ins. at 30° obliquity, 1000 yards 3.2 ins. at 30°, 4.1 ins. normal—2000 yards 2.5 ins at 30°, 3.1 ins. normal—2500 yards 2.2 ins. at 30°, 2.8 ins. normal. Additional armament on this vehicle consists of a 7.92 M.G. 37 (t) on a ball mounting in front superstructure; Discharger for 5 smoke generators, fired by cable from fighting compartment; 9 mm machine carbine. Height 8 ft., 1 1/2 ins. Ground contact 8 ft., 63 ins. Pitch of track 41 ins. Engine Praga 6-cyl., gasoline, 125 h.p. This equipment, which is primarily a tank-hunter, was created by combining the 4.7 cm Czech antitank gun with the chassis of the Pz. Kpfw. I, Model B tank. Consequently its road performance approximates that of the Model B tank. The turret arrangement consists of a three-sided welded shield, open at the top and rear, bolted to the superstructure by means of internal flanges. The driver’s seat is on the floor to the left rear of the gear box. The fitting of the gun to the chassis is crude in many respects and not up to the usual standard of German workmanship or design. The gun is mounted on a steel frame, within the shield, in the front half of the vehicle. It is a single shot, high velocity weapon. The barrel is a one-piece forging fitted with a large and heavy muzzle brake and flash eliminator. The breech mechanism is of the vertical sliding block type. The gun is automatically cocked when the breech is opened. The elevating gear is on the left hand side of the gun and is controlled by an elevating wheel with a folding handle. The traversing gear is behind the elevating hand wheel. Traverse is limited by a spring-loaded stop to 15 deg. left or right. The recoil mechanism, which consists of a spring recuperator and liquid buffer, is housed in a cylindrical casing above the piece. The gun utilizes the following types of ammunition—(1) A.P. tracer shell, (2) H.E. shell. At 300 yards the A.P. projectile effects a penetration of homogeneous armor of 2.3 ins. at 30 deg. obliquity; 3.0 ins. normal, and at 1000 yards will penetrate 1.8 in. at 30 deg. obliquity; 2.4 ins. normal. Length 14 ft., 6 ins. Width 6 ft., 9 ins. Ground clearance 11 1/2 ins. Tread centers 5 ft., 8 ins. Pitch of track 3 11/16 ins. Muzzle velocity (AP) Wt. 3.6 lb.—2540 f.s. Effective range (HE) 1520 yds. The Jägdtiger was the most formidable self-propelled antitank gun used by the Germans. 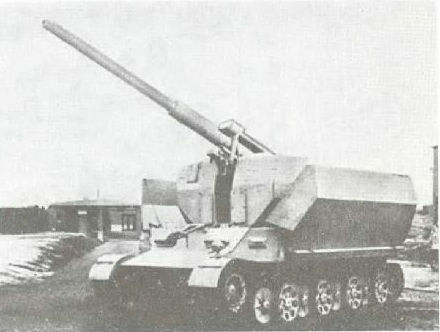 It consists of a 12.8 cm PJK 44 (L/55) (less muzzle brake), mounted on a Tiger B chassis. The hull consists of the normal Tiger B with a builtup superstructure to form a fixed turret. The front plate of the superstructure is 250 mm thick and slopes back at 15° to the vertical. It is made of one solid piece of cast steel armor. The sides of the superstructure are made in one piece with the sloped sides of the fixed turret and, like the Tiger B, are 80 mm thick sloped at 25 degrees. The rear plate of the superstructure is also 80 mm thick with a 10° slope. The main armament consists of a 12.8 cm PJK 44 set in the center of the front plate of the built-up superstructure. It has a cast, bell-shaped gun shield similar in design to that of the 8.8 cm Kw. K. 43 on the Tiger B. The spherical housing of the gun cradle mounting pivots on a steel ball. The gun is electrically fired and has a vertical sliding breechblock. Separate loading ammunition is used, and the same cartridge case is utilized for armor piercing and high explosive rounds. With A.P.C. ammunition, penetration of approximately 6 inches of armor at 1,000 yards at 30° is effected; with A.P.C.B.C. ammunition, the penetration is approximately 8 inches. Length (overall) 23 ft., 11 ins. Width (overall) 12 ft., 7 ins. Height (overall) 9 ft., 3 ins. Ground contact 13 ft., 4 ins. Width of track 26/31 1/2 ins. Pitch of track 5.9 ins. This self-propelled antitank gun consists of the 7.5 cm Stu. 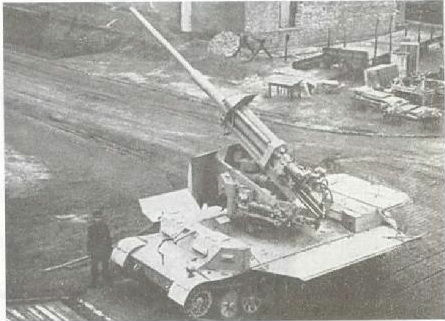 K. 42 (L/70) mounted on a modified Pz. Kpfw. IV chassis. The vehicle is of all-welded construction except that the fighting compartment roof is bolted. The upper and lower nose plates are interlocked with each other and with the hull sides. The upper nose plate, set at an angle of 45° to the vertical, has a thickness of 80 mm. The lower nose plate, set at an angle of 55° to the vertical, has a thickness of 45 mm. The superstructure front plate is interlocked with the superstructure side plates and additional strength is provided by two brackets which are welded into recesses in the hull sides and bolted to plates welded to the superstructure front. The crew compartment occupies the front three-quarters of the vehicle and accommodates a crew of five. The remaining quarter houses the engine which is the standard Maybach HL 120 as fitted in the Pz. Kpfw. IV. The gun, which has no muzzle brake, is ballistically similar to the 7.5 cm Kw. K. 42 as mounted on the Pz. Kpfw. Panther. It is located eight inches to the right of the hull center line. The hydraulic buffer and hydropneumatic recuperator are mounted above the piece, the buffer being on the left. The recoil gear is protected by a cast mantlet with curved outer surfaces. Stowage is provided for 55 rounds of ammunition, all except four being stowed horizontally. A port is provided in the superstructure front plate to the right of the 7.5 cm gun, behind which is a small machine gun ball mounting, five inches in diameter. Length 19 ft., 9 1/2 ins. Width 10 ft., 4 /4 ins. Height 6 ft., 5 ins. Tread centers 8 ft., 1 1/4 ins. Ground contact 11 ft., 6 ins. Width of track 15 ins. Pitch of track 4 3/4 ins. Armament 7.5 cm Stu. K. 42 (L/70); one M.G. Engine Maybach HL 120 TRM, 320 hp. The chassis of this self-propelled antitank gun is a modified version of the chassis for the Czech Model 38 tank. The lower nose of the hull is 60 mm thick set at 40° and interlocked with the sides and upper nose plate. The upper nose plate is 60 mm thick. It is positioned at an angle of 60° and extends to the top of the superstructure. Brinell hardness is approximately 240. All-welded construction is employed except in attaching roof and superstructure rear plates which are bolted on for reasons of accessibility. The two latter plates are 8 mm horizontal and 8 mm at 70° respectively. The side superstructure plates are 20 mm set at 40° with a brinell hardness of approximately 195. The hull floor plate is 10 mm. Side apron plates of 5 mm give added protection against high explosive shell fire. The 7.5 cm Pak 39 (L/48), mounted 15 inches to the right of the hull center line, has an improved type of recoil mechanism. This allows the muzzle brake to be discarded. Elevation is from -6° to +10°. Traverse overall is 16° (-11° right -5° left). A new type machine gun mount is built in the roof. The machine gun is fitted with a periscopic sight and extended trigger, and may be traversed in any direction and fired from within. A Sfl ZF 1a sight and an episcope is provided for the main gunner. The sight projects through the roof. The loader has an episcope fitted in the rear portion of his hatch fixed at 6 o’clock. The steering mechanism is the usual controlled differential type which allows curves of 29½ foot radius without “steering losses.” Curves of smaller radius are obtained by using the track brakes of the additional clutch brake system also provided. There are two fuel tanks with a total capacity of 85 gallons. Ground pressure is 11.9 pounds per square inch. The power to weight ratio is approximately 9 HP per ton. The Fu 5 radio is fitted. Commanders equipments carry an additional Fu 8. Length (overall excluding gun) 15 ft., 11 ins. Width (overall) 8 ft., 7 1/8 ins. Height (overall) 6 ft., 10 1/2 ins. Ground clearance 1 ft., 4 3/4 ins. Tread centers 6 ft., 10 1/2 ins. Ground contact 8 ft., 11 1/2 ins. Width of track 1 ft., 1 3/4 ins. Pitch of track 4.1 ins. Fording depth 2 ft., 11 ins. Armament 7.5 cm Pak 39 (L/48); one M. G. 34; one M. G. 44. Ammunition (Rds.) 7.5 cm gun, 41 rds. ; M. G. 34, 600 rds. ;* M. G. 44, 180 rds. Engine Czech EPA (Type TZJ), 6-cyl., inline, 158 hp. at 2,600 r.p.m. *In addition to the ammunition mentioned above, 12 rounds of signal ammunition, 20 egg hand grenades, and 6 smoke candles are carried. Edited by Guevarache, 10 October 2012 - 03:37 PM. Myslím,že to nebude podvozek z PZ IV,ale něco zcela nového.